Hannan senior Dalton Coleman (13) dribbles around a screen during the first half of a Feb. 7 boys basketball contest against Teays Valley Christian in Ashton, W.Va.
CHARLESTON, W.Va. — Hannan senior Dalton Coleman was the lone Mason County athlete chosen to the 2019 Class A all-state boys basketball team, as voted on by members of the West Virginia Sports Writers Association. Coleman — a 6-foot-1 guard — led the Wildcats in scoring with 13.3 points per outing. Hannan finished the year with an 8-14 overall record. 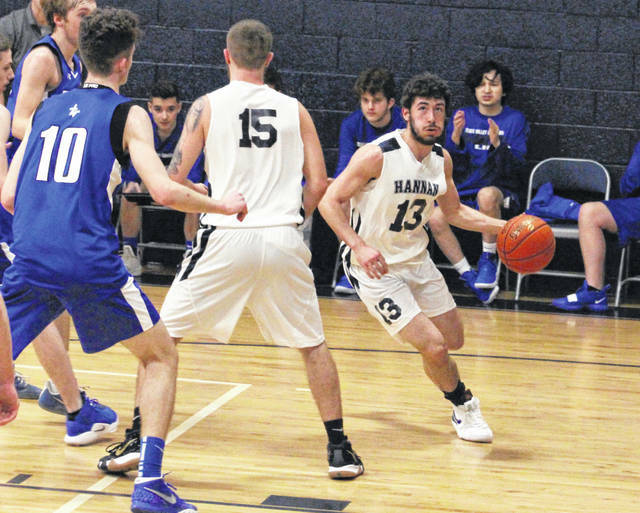 It is the first all-state selection for Coleman in basketball, who also became the program’s eighth 1,000-point career scorer in boys history this past season. Cade Ullman was named the first team captain, while Cullen Cutright of Williamstown was the second team captain. Jessie Muncy of Tolsia was the third team captain. Cade Ullman, Parkersburg Catholic (captain); Dorian Groggs, Webster County; Noah Midkiff, Greenbrier West; Jay Moore, Greater Beckley Christian; Gabe Zummo, Notre Dame; Griffin Phillips, Tyler Consolidated; Robby Williams, Charleston Catholic; Tyler Gray, Webster County. Jacob Holliday, Richwood; Joel Robertson, Trinity; Cullen Cutright, Williamstown (captain); Anthony Robbins, Wheeling Central; J.C. Maxwell, Wheeling Central; Caleb Jenkins, South Harrison; Jaidyn West, Notre Dame; Collin O’Dell, Greenbrier West. Jessie Muncy, Tolsia (captain); Brent Barnette, South Harrison; Gavin Smith, Van; Jeb Boice, Parkersburg Catholic; Chance Potter, Greater Beckley Christian; Samuel Wykle, Summers County; Corrick Ambrose, Tucker County; Briston Bennett, Trinity. Chris Abbott, Sherman; Clayton Bee, Ritchie County; Evan Boniti, Madonna; Trevor Carder, Calhoun County; Boston Caruthers, Williamstown; Ethan Colegrove, Tug Valley; Dalton Coleman, Hannan; Connor Cunningham, Doddridge County; Gavin Dietrich, Madonna; Adam Falbo, Valley Fayette; Nick Fenstermacher, South Harrison; Brady Fitzwater, Gilmer County; Aiden Funkhouser, East Hardy; Jake Gamble, Magnolia; Logan George, Tygarts Valley; Locca Giannini, Valley Fayette; Nate Gibson, Buffalo; Jared Gladwell, Meadow Bridge; Alec Hanshaw, Buffalo; Nathan Hanshew, Midland Trail; Tyler Hardesty, Notre Dame; Nate Helm, Notre Dame; Hunter Hickman, Wirt County; Drew Holcomb, Webster County; Braydon Huffman, Harman; Eli Inman, Williamstown; Austin Issacs, Midland Trail; Avery Kincade, Valley, Wetzel; Leon Lambert, Montcalm; Tanner Lett, Doddridge County; Joel Maurer, Notre Dame; Caleb May, Tug Valley; Dillon Meintel, Cameron; Travis McCoy, Hundred; Travis Mickey, Cameron; Nick Moore, Calhoun County; Riley O’Dell, Greenbrier West; Bray Price, Wheeling Central; Caleb Price, Van; Devin Raines, Ravenswood; Ryan Reasbeck, Wheeling Central; Coby Ridgeway, Paw Paw; Kobe Rozell, Meadow Bridge; Mark Rucker, Tyler Consolidated; Matt Saxon, Paden City; Marcus Sites, Pendleton County; Trey Slider, Paden City; Jeffrey Snyder, Tucker County; William Steele, St. Marys; David Stewart, Van; Ty Sturm, Parkersburg Catholic; Zion Suddeth, Charleston Catholic; Cole Taylor, Webster County; Luke Vass, Fayetteville; Tyler West, Tyler Consolidated; Daniel Woods, Trinity.